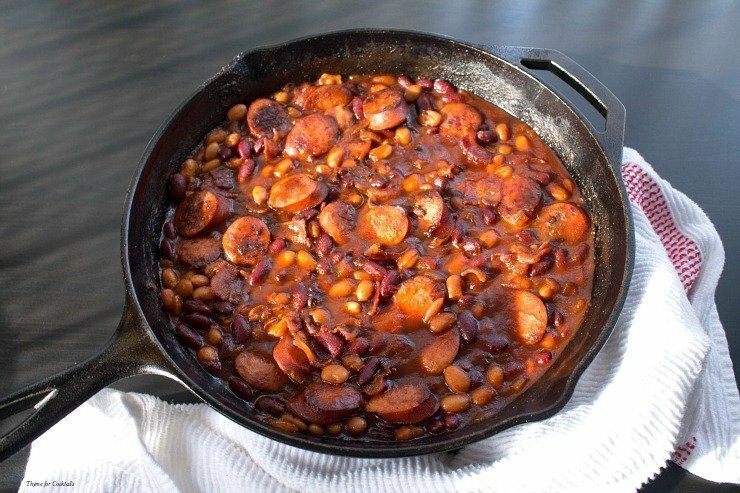 Chipotle Bourbon Porky Beans is a delicious skillet meal that gives classic pork and beans a boozy twist. 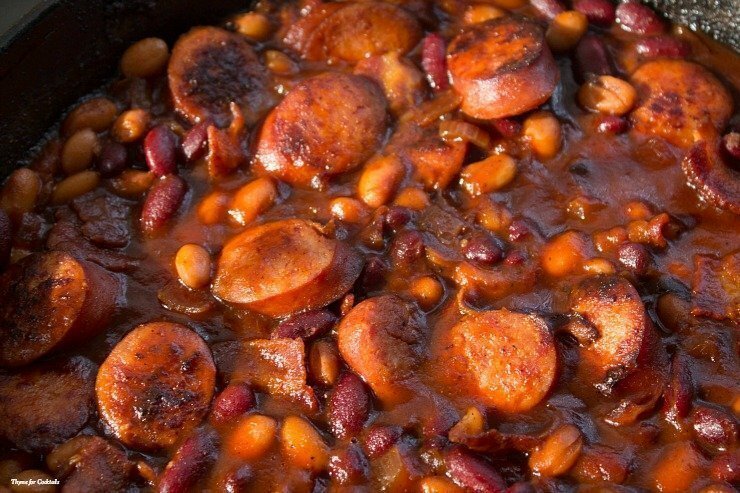 Bacon, kielbasa & 2 kinds of beans in a rich chipotle bourbon BBQ sauce. It is 57 degrees and rainy in Arizona, pretty much sucking all the motivation out of me this morning. I was up a little after 5am to take the kid to an early JROTC meeting and could not go back to sleep. For the last few days I have been working on sponsored blog posts and today my only desire is to be a lazy bum on the couch. Since that won’t pay the bills I figured I would share this awesome recipe I dreamed up a few weeks ago. It is one of those amazing recipes that was a happy accident. The first time I made it was on a random Saturday when I had no real desire to cook. After scanning the contents of the fridge I found bacon and kielbasa. Skillet meals are my go-to when I am feeling lazy in the casa kitchen. It is easy to toss together a few pantry ingredients, add a few fresh ingredients and call it a day. 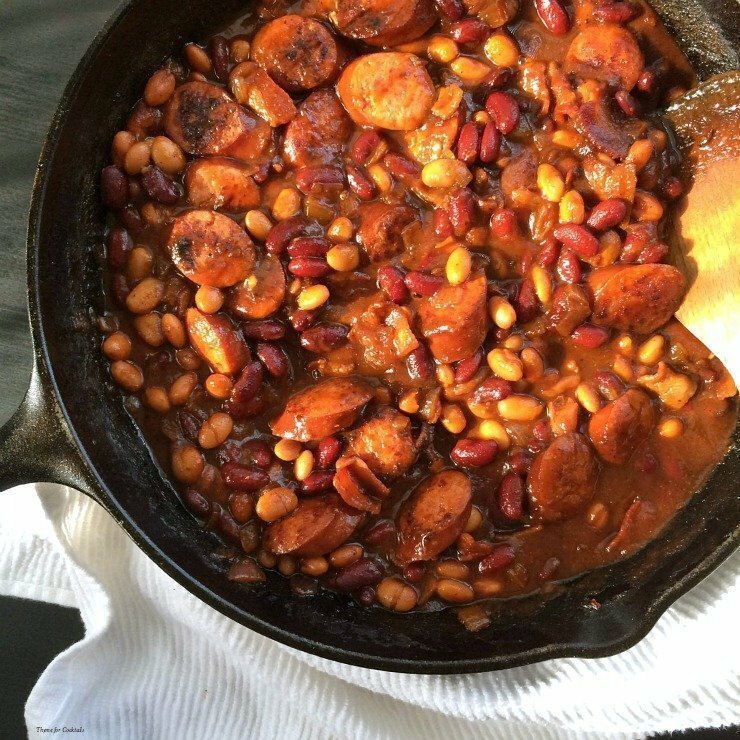 I had, what I thought, was a brilliant idea to make a grown-up version of beens and weenies. Go easy on any salt in this dish, there are already salty ingredients like soy sauce and Worcestershire sauce. For the cider vinegar I used a fun flavor version I found from Heinz, Pepper Perfect on Amazon. If you buy it through my link it doesn’t cost you extra but I earn a small commission from it! 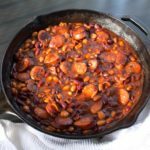 Chipotle Bourbon Porky Beans ~ This delicious skillet meal gives classic pork and beans a boozy twist. 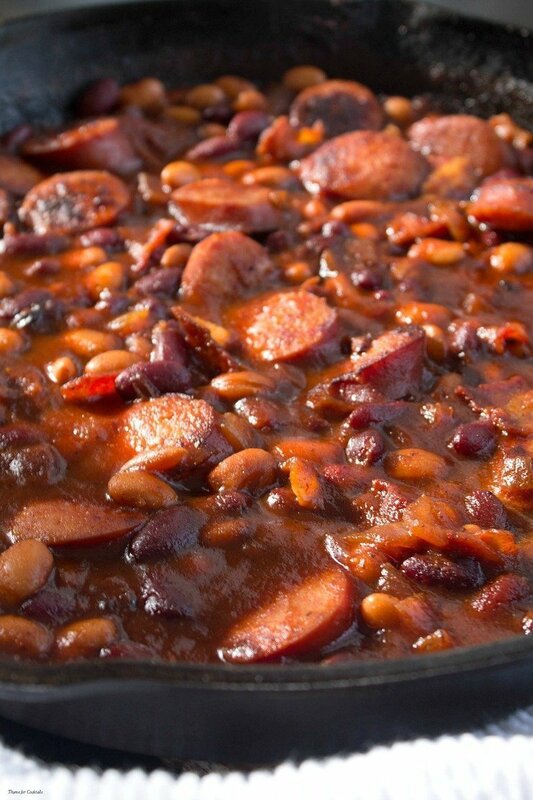 Bacon, kielbasa & 2 kinds of beans in a rich chipotle bourbon BBQ sauce. Heat a large cast iron skillet to medium heat, add bacon and cook 5-6 minutes until crispy. Remove and drain on a paper towel lined plate. Set aside. 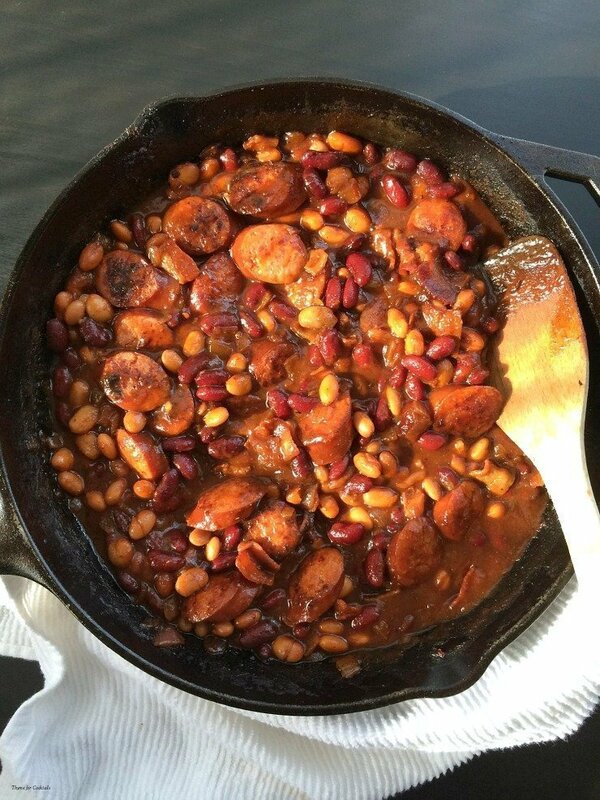 Add kielbasa to skillet and brown, 4-5 minutes. Remove and add to plate with bacon. Add onion and chipotle to skillet, cook 2-3 minutes. Stir in ketchup, brown sugar and tomato paste, cook 2-3 minutes stirring occasionally. Stir in chicken stock, scraping bits off bottom of the skillet. Mix in remaining ingredients plus kielbasa and bring to a low boil. Reduce heat and simmer 8-10 minutes until sauce thickens. Stir in bacon and serve immediately. This looks good! Like perfect comfort food that’s just filled with yummy flavors! I adore chipotle, and you added bourbon too! Awesome! Your beans look great. I love the sausage and the bourbon! Love this (I’m a super-duper skillet meal lover, too!) Good tip to go easy on the salt – I usually forget! YUM!